Notice that refreshingly cold smoothies don’t have the same appeal during wintry weather? Give your smoothies a winter makeover by serving them hot and toasty. (It’s not as strange as it sounds—promise!) These ice-free, warm smoothie recipes will warm you up after a chilly morning jog. It only takes six simple ingredients to whip up an outrageous oats and chocolate smoothie. Safety tip: Don’t fill your blender or smoothie maker with boiling liquid! The steam creates pressure that can cause the lid to blast off, literally. Add the hot ingredients at the end. Whilst it’s blending, further heat the rest of the almond/chocolate mix until hot, but not boiling. This warm smoothie has all the taste of an old-fashioned, homemade apple pie—minus the hassle of baking. Plus, at 124 calories and 0 grams of fat per serving, you can slurp with a clear conscience. Combine apple, water, vanilla, maple syrup and spices in a blender. Blend until smooth. Pour into a mug and microwave on high for about 2 minutes. Sprinkle with cinnamon, and if you’re feeling particularly daring, add a bit of whipped cream on top. Serve! The tryptophan and vitamin B6 in bananas helps to boost your body’s production of serotonin, which can improve your mood and increase feelings of satisfaction and relaxation. Place all ingredients in a high speed blender (such as a Vitamix) and process until smooth and creamy. Serve warm. Need a healthy way to detox? 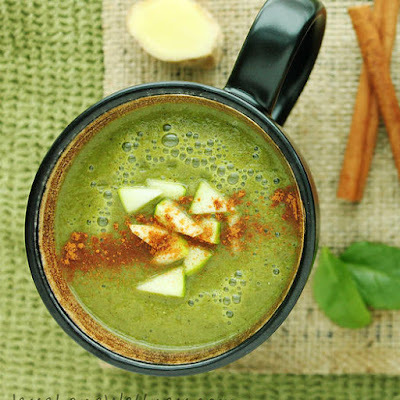 This warm cider smoothie packs a ton of fiber, iron, and antioxidants – thanks to ingredients like fresh apples and spinach. You can enjoy at this apple cider smoothie at room temperature or cool it down by blending in ice cubes. To enjoy it hot, either heat it by running the Vitamix for 5 minutes or warm it in a pot on the stove.